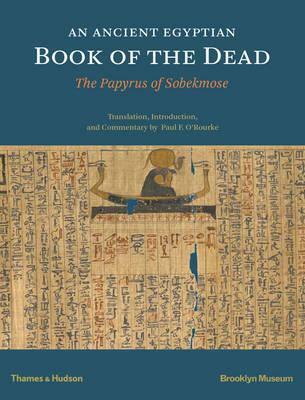 The Book of the Dead of Sobekmose, in the collection of the Brooklyn Museum, is one of the most important surviving examples of ancient Egyptian Books of the Dead. Such â€œbooksâ€â€”actually papyrus scrollsâ€”were composed of traditional funerary texts, including magic spells, which were thought to assist the deceased on their journeys into the afterlife. The ancient Egyptians believed in an underworld fraught with dangers that needed to be carefully navigated, from the familiar, such as snakes and scorpions, to the extraordinary: lakes of fire to cross, animal-headed demons to pass, and the ritual Weighing of the Heart, whose outcome determined whether or not the deceased would be born again into the afterlife for eternity. Virtually all of the existing published translations of material from the Book of the Dead corpus are compilations of various texts drawn from a number of sources, and many translations are available only in excerpt form. This publication is the first to offer a continuous English translation of a single, extensive, major text from beginning to end in the order in which it was composed. This new translation not only represents a great step forward in the study of these texts but also grants modern readers a direct encounter with what can seem a remote and alien, though no less fascinating, civilization.